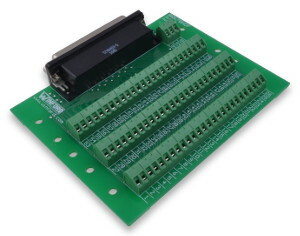 These breakout boards bring all 78 pins of a DB78HD (high density, 4 row) Female connector out to screw terminal blocks for easy connection and prototyping work. These break out boards are perfect for experimentation and prototype work, as well as for use in the educational laboratory. 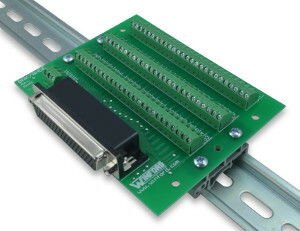 They are well-suited for interfacing with data acquisition equipment or any other devices that use a DB-78 connector. A breakout board is sometimes referred to as a "transition module", "terminal board", "terminal block", "breakout box", "breakout adapter", "terminator", or "interface module". Winford Engineering offers 78-pin DSUB cables (shown below) which are compatible with these breakout boards. Several lengths/connector configurations are available. Approximate dimensions: 3.6" x 4.6"